Well, time to clear the inbox of a few more places I'm having trouble making myself write about. Today's theme is "What the hell happened to these places I used to love?!" Just after the turn of the century, I spent a couple of years living in Upstate New York. My tastes were still pretty narrow and unrefined at that point, so most of my dine-out meals came from fast food joints, diners and hole in the wall Chinese places rather than the amazing variety of inventive and ethnic cuisines that were available to me (so many missed opportunities...sigh). Still, I have never wavered in my love of breakfast food, and after my favorite chain for early morning eats (Perkins) left town, I needed a replacement What I found was The Original Pancake House. After I moved back to Idaho, an OPH location opened in Eagle, but closed not long afterward. Another has now opened near the intersection of Fairview and Curtis, but does it stack up to my memories of the place? Name aside, I never really cared for their pancakes. The thing that brought me back time and time again were the omelettes, which are baked and as I understand it have some pancake batter mixed into the eggs. They were always flavorful, fluffy, moist and outrageously filling. While still fluffy and filling, the other two things I loved were nowhere to be found when I cut into this thing. It was dry, it was bland (I ended up showering it with salt, pepper and hot sauce). There was also barely any cheese at first, but it turned out not to have been distributed very well. The oils from the cheese moistened the omelette a little more in a few places, but the cheese itself lacked bite and the whole was very disappointing. My roommate's Green Chile & Monterey Pepperjack Cheese Omelette wasn't much better, but it did benefit from the addition of salsa. The pancakes were competently executed enough, but I found the syrup to have a distinctly unpleasant under/aftertaste. The coffee left a lot to be desired as well. Maybe I've just been spoiled by the likes of Joe Momma's and Goldy's, but I just can't see myself returning to OPH anytime soon. 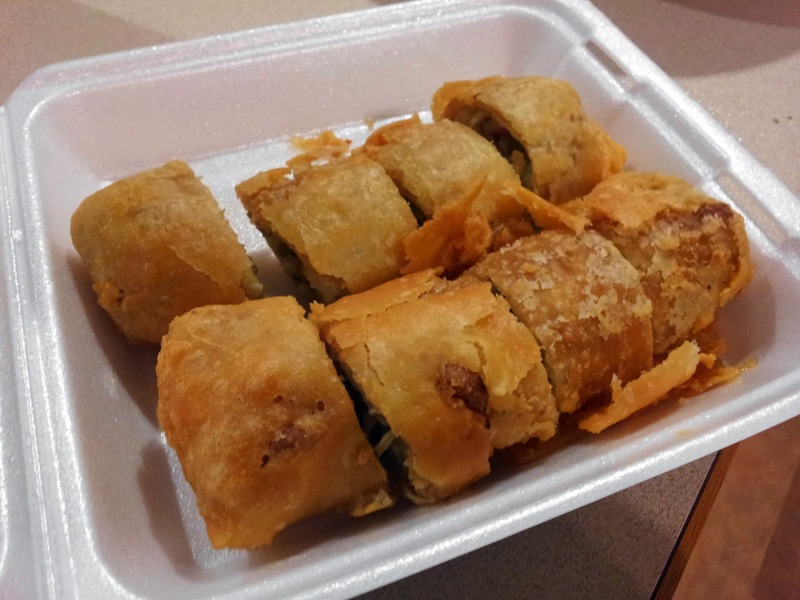 The egg rolls at Twin Dragon are huge. Unfortunately, these days they're also a little over-browned and greasy. If you order them, hot mustard can be your friend, but you'll lose about a third of the filling from each piece while trying to dip them. You've been warned. 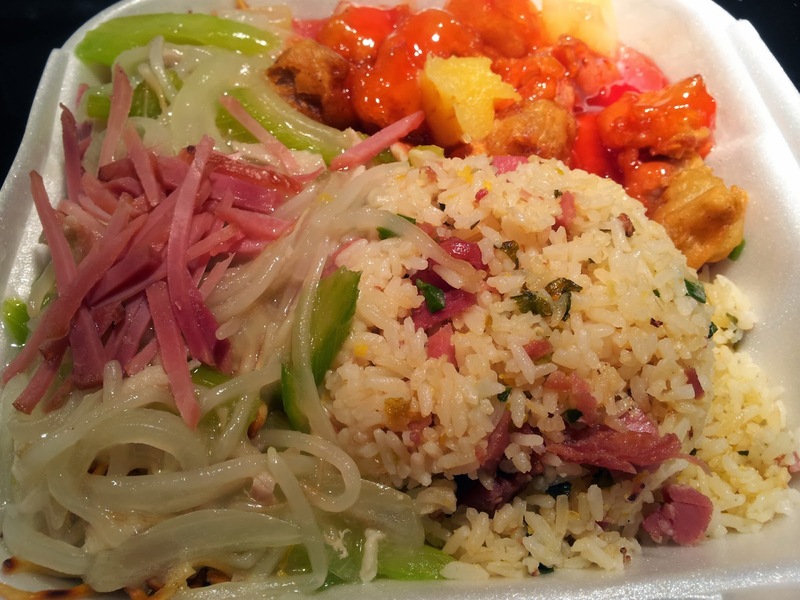 Clockwise from top right: sweet and sour pork, pork fried rice, pork chow mein. For some reason, they've taken to putting lettuce in with the sweet and sour entrees, which gives the whole a kind of strange flavor that I don't like. The thick, crunchy chow mein noodles that I used to love have been replaced with soft ones that always seem to get a little burnt in places during the stir frying process. The one thing that hasn't changed is the pork fried rice. Same basic combination of diced ham, egg, and green onion, and the same slight oiliness that, along with the starch from the rice, soaks up alcohol so well. I think that the next time I'm in the mood, I'll just get a large box of the fried rice to go. Maybe it's the candy-coated glasses of nostalgia talking, but I could have sworn the place used to be more of a 50's-style diner. Either way, it's actually a 50's theme diner. The difference? I don't believe there was any place this garish open during the 50's. 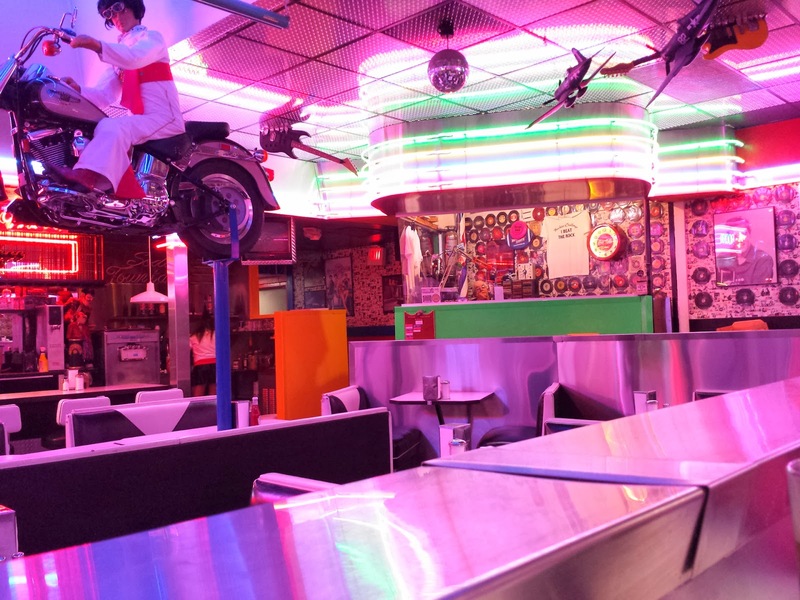 Neon everywhere, a mannequin riding a motorcycle suspended from the ceiling. Along with a disco ball. And model airplanes. There are also guitars embedded into the ceiling, because why not? In an elevated booth at the back, an older man sat. There was a wall of glass in front of him and a wall decorated in vinyl records behind him. Turns out he was doing sort of a DJ thing. He spent most of the time leaning his head on his hand. Only his very occasional movements assured me that he was still breathing (eventually he perked up long enough to advise that someone in the parking lot needed to move their car). At least he had a kind of bowling-style shirt on, the other male employees offered nothing to the theme, they just wore Rockie's t-shirts. The roller-skating waitresses, who I'm pretty sure used to just dress pretty casually (albeit a little risque) in t-shirts or tank tops and shorts or mid-thigh skirts, were now in some kind of bizarre nigh-fetish wear that I would have guessed was Japanese-inspired if I saw someone wearing it on the street. The outfit of the moment consisted of long socks, a tank or t-shirt with a white button-up shirt over it that was open yet oddly tied at the waist, and a very short skirt made of shiny black material that I didn't examine too closely for fear of being noticed. And when I say the skirts were short, I mean REALLY short. On the shorter waitress it wasn't a HUGE concern, but I remember thinking that the taller one probably needed to keep up on her waxing. I probably just gained them a few customers by mentioning that, which is fine and dandy if that's the sort of thing you want. It's not the sort of thing I personally want when I have children in tow. I debated with myself about posting this. I'm doing it to prove I'm not exaggerating. Moving on. Our waitress (the shorter one, thankfully) seated us, and we perused the menu while the old rock n' roll played and poorly-working ceiling-mounted TVs flickered in the background. I noticed that whoever wiped down the table last had done a really bad job of it, and were it just myself I would have walked out by that point, but I made a promise to the kids. Both children picked the cheeseburger kid's meal, which is a pretty decent deal at $3.50. I was curious about the burger shown on the TV but not sure I wanted anything that big. Looking at the menu, I can't figure out what I got. I was wavering back and forth between the Earthquake Burger (2 1/4 lb. patties, Swiss & American cheese, lettuce, tomato, pickle and special sauce) and the Johnny B. Good Burger (3 1/4 lb. 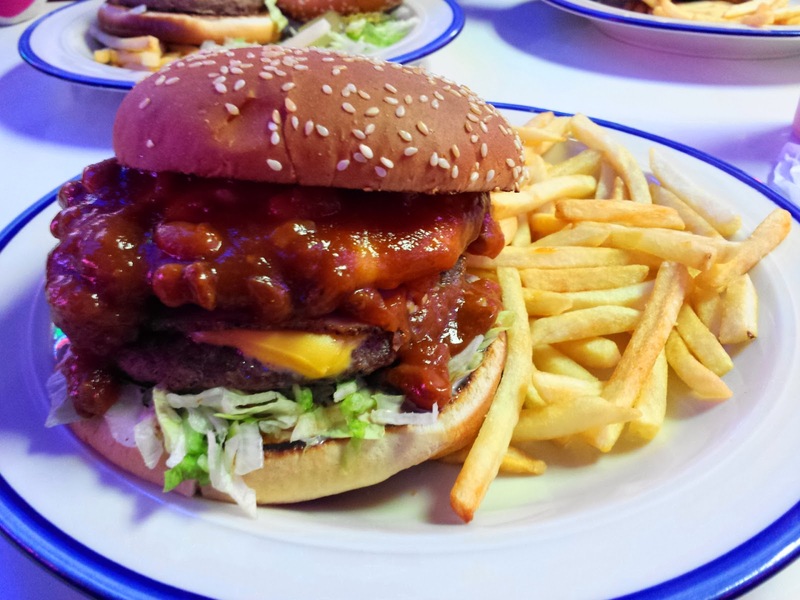 patties, pastrami, a hot dog, Swiss & American cheese, lettuce, tomato, grilled onions, mayo, all covered in homemade chili). Looking at the pictures, I'm seeing two patties, pastrami and chili, but no third patty or hot dog. I have to give them points for grilling the bun, which makes me happy, but I have to subtract points for not heating burger itself long or well enough to thoroughly melt the cheese. The kids were happy enough with this, but given what lurks on most kid's menus, that only goes so far. Attacking whatever the hell it was I got with a knife and fork, I was thoroughly underwhelmed. My burger hadn't been warmed enough to melt the cheese either. 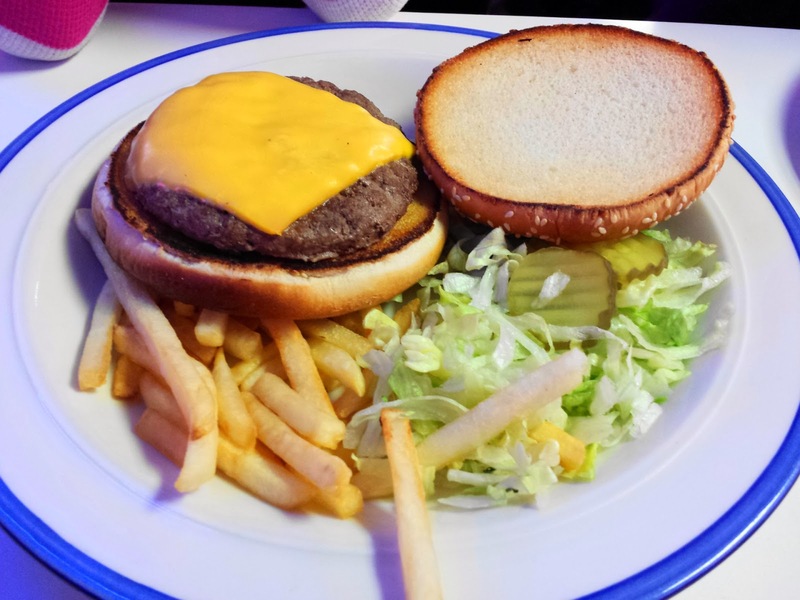 Worse, everything screamed pre-packaged, processed, and frozen, from the uniformly sized and shaped burger patties to the yellow pseudo-cheese and the shredded iceberg lettuce. It tasted like something you'd get from a bad drive-through. Even the chili wasn't that distinctive, amazing considering how many times it appears throughout their menu. Don't even ask about the fries. I don't know if I'm remembering the place more fondly than it deserves, or if things have just gone way downhill since Adam Richman was in town. What I can tell you that this place is simply not worth your time or money.